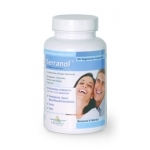 Serranol is a combination of SerraEnzyme 120,000IU, Curcumin750mg, Ekloma Cava Seaweed and 3000IU of D3. I have not had much experience yet with this product but a friend started on it. At first I was a little sceptical as I was used to the SerraEnzyme on its own. I had thought the potency of the enzyme would be compromised in a blend, but I was wrong. The potency is high and with the Curcuminx4000 and other ingredients this product is proving to be another little miracle worker. WHat Does Vit D Do4U? Vitamin D & Skin & Cancers Issues.